For this fortnight Patter has given us the word "Prayer" for our artwork. When I went looking for a scripture to use I found this lovely one which has a song based on it which I will share a website below where you can read the words and click on the link to listen to the song being sung. Prayer is an area of my walk with the Lord where I know I fail him miserably. I do not know why I do not discipline myself more and set aside proper prayer time. Patter's devotional thoughts have been good timing for me to search myself and ask myself.... why??? why don't I take time to pray. 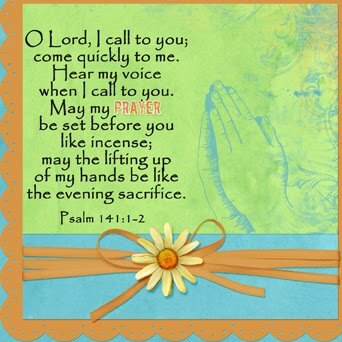 I know I am constantly talking to the Lord during the day but do not go aside for a proper quiet time. If Jesus did it I should also. For my digital artwork I used a kit called Prayer and Praise by Thao Cosgrove and the scallop edge is a template by Ursula Schneider. This is so beautiful! Love the praying hands and the scripture! 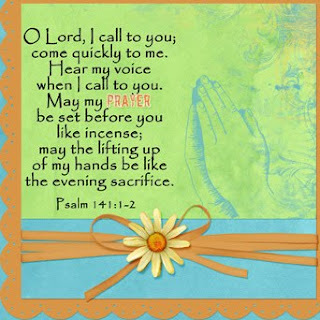 Blessings, and I pray He helps you find the perfect time each day to spend alone with Him.